Best 5 games of my choice of the week as was announced. 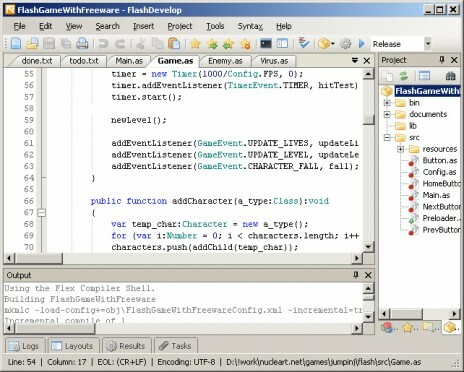 «Games for Sale» — Presentation for FlashGAMM! #5 meeting. The ways to create a game for a large company to buy. What’s the common for various promo games and what differs them from games with other monetization models. A lot of technical info condensed in several cases. The session's video @ vimeo (in Russian). Hope it's useful for You! PS. 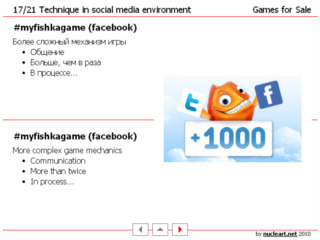 There is a lot of newer info on the topics: social media and games, ad gaming, branded games. Is anybody interested in updated and extended article? I'm going to post 5 best games of my choice every week. Players wanted! 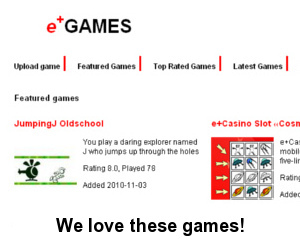 e+Games our team favorite games and more. A lot of oldschool, retro, classic game remakes and the best of new releases we love. We are just testing our e+CMS solution as game portal now. It's free and open source if anybody interested can get game portal for free. So welcome to play the games we liked or upload Your games here no restrictions only premoderated.